Superstare kindlasti, nr 40 ning Eestist. Olen mitu aastat lugeja juba olnud. I just wanted to thank you for doing these fantastic giveaways for us, we really appreciate it! I love your style btw and you inspired me to create my own blog and a youtube channel so thank you for that as well. Thank you first for the amazing giveaway. Just if i won, i will choose the Stan Smithe ones. My size 39. I'm from Riyadh. Üli äge aga meeldivad AdidasOriginals STAN SMITH jalatsid. Meeldib ka käija kus iganes vaba aja jalatsiga, kuna mugav ei koorma jalga jne. ja kui veel ilus ka supper . Jâlgin Tallinnast. Adidas Superstar 80s, suurus 39. Mina tahaksin omale jalga torgata Adidas Originals Stan Smith jalatsid, suurus 38. Adidas Superstar 80s, my size - 38. Adidas superstar 80s, suurus 41. I'd love Superstar 80s size EU38 / UK5, thank you! Väga kift loosimine jälle!Lemmikud Adidas Superstar 80's nr 38.Jälgin Helsingist. Adidas Originals Stan Smith 38, Mariah Orover,jälgin blogi Pärnust. Adidas superstar s39 palun :) Loen blogi ikka Eestist. Tahaksin endale Adidas Superstar'e suuruses 39. Sooviks Stan Smith'e ja suurus 37. Hi Stella.Thank you for the awesome giveaways you sponsor for us! I love entering and have my fingers crossed to win! Lovexxx your blog and follow on facebook twitter and IG. Hetkel loen Tamperest Soomest ja jälgin sinu lehte! thanks again for all the fun, who wouldn't love a new pair of sport shoes? I follow you on FB and instagram. Adidas Originals Stan Smith. Size 38. I'm from the Philippines. Hi! First off, I would like to thank you for this opportunity. I'm from the Philippines. I prefer the Adidas Superstars(size 8.5/9). Again, thank you! Please describe it in english, if this giveaway is truely open for international. Hi! Adidas Originals Stan Smith, Woman Sizes: EU size 40, US size 8, Uk size 6.5. I'm from Venezuela - South America. Stan Smith, 38 EU. I'm from Spain. Thanks!! Amazing X'mas and New year gift- My shoes verry old and when i saw this give away i cannot screamm Yahhhhhh! I am from Hồ Chí Minh City - Việt Nam. I hope i will lucky to win this chance. Happy Holidays from Romania ! I like Original Stan Smith, mine is 41, Indonesia. Please give a chance for Indonesian people, thanks. I would choose the Stan Smith shoes. I'm from Ontario Canada and I wear a size 11. WOW VERY GENEROUS GIVEAWAY and those shoes are a very nice color, i am from ontario canada and i wear a size 6.5 in womens i think this is so cute!!! If a am lucky enough to win this give away i would love to choose the superstars!! I like the Stan smith ones. I want the super stars!Size 9 and a half please! Thank you so much for all your giveaways this would be a dream come true !! Hi, thank you a lot for the amazing giveaway. Stan smith please. Have a great day! Adidas superstar ja nr 37. Hi, I prefer Adidas superstar, my size 7(US). Minu lemmikud on Adidas Originals Stan Smith jalatsid, jalatsi suurus 41. I wear size 9. I am from Kamra, Pakistan. I really need them please. 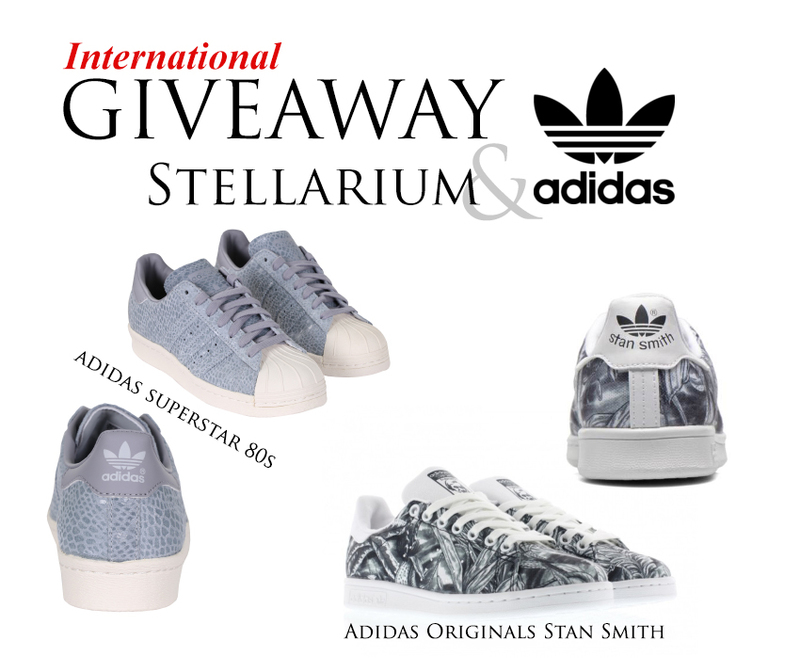 I would love to have Stan Smith as a birthday gift on January 14th ;) Thanks for hosting this giveaway I'm joining all the way from Philippines. My shoe size is 7US/ 38EU. Merry Christmas and Happy New Year! More Power! I would love to have Adidas Superstar 80s, my size - 38. I am from Alberta, Canada & like the Adidas Stan Smith shoes, size 39. Thank you, Happy 2016 & all the best in the new year! I would love to win Adidas Stan Smith! But I don't have Instagram. Can I participate? Thanx for the giveaway :) Adidas Originals Stan Smith size 40 :) I am from India. Adidas Superstar 80s, suurus EU 37,5. Sellist giveawayd olen väga oodanud. adidas superstar 80s on minu jaoks disainitud! Thank you first for the amazing giveaway :) If i won, i will choose the Stan Smith ones. My size is 42. I'm from Portugal! Adidas Stan Smith size 36.
i love the superstar 80's sneakers i would love to win those. Hi, I'm micha from the Philippines but I'm living in Saudi. I would LOVE the Adidas Superstar size 38! Perfect for my upcoming birthday at 28! Followed you on both platforms. Thank you for this opportunity :D God bless. I am from the USA and Love the Stan Smith Black and white pair! I wear a size 8 USA. Hello I am from the USA located in Ahoskie, North Carolina. I am originally from Los Angeles, California, but I now live in Ahoskie, North Carolina. I would like a size 11 of the Stan Smith Adidas. Happy Blessed New Years. Adidas Superstar 80s, suurus 39! Wintery greetings from SWEDEN!! Adidas Superstar 80s, US size 8. Hello from the Philippines! I'm a size W9.5 (US)/ 41 (Europe). Thanks for doing this awesome giveaway. I would love to win the Superstars, I'm size eu-37 1/3 or us-6 of adidas shoe size chart. These are awesome! I really like the Stan Smith 80s style in size 8.5. I'm from Chicago and have followed on IG (name Marnie470) and followed on FB (name Derrick Todd). Shared on Facebook as well. I like the superstars. Thanks for the chance. I want the Stan Smith and I am from India and my foot size is 10. I would love the Stan Smith, US size nine. I'm from the US. I would like STAN SMITH NO 38 I am from KENYA. I would love the adidas Stan smith. I wear US size 9. I'm from Nigeria. Thanks for the opportunity and love the travel diaries. I like the Superstars, size 7. I'm from NY, USA. This is such a cool giveaway! I completely adore Adidas and all the different ways you can wear them. The Adidas Originals Stan Smith are my favorites, I'm a size 8 in the United States (I'm from Portland, Oregon!) and a 41 European. Superstar EU suurus 39, olen Eestist! Adidas Superstar 80s, EU - 39. I am from Romania, Bucharest. I love love love these Superstars! I'm a size 38. I live in Tallinn.